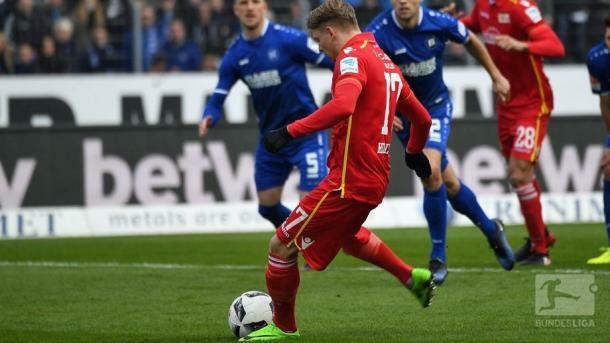 Union Berlin earned all three points as their efficiency was enough to beat hosts, Karlsruher SC at the Wildparkstadion. Karlsruher SC: (4-4-2) Orlishausen; Bader, Figueras, Kinsombi, Kempe; Valentini (Mehlem 39'), Meffert (Reese 84'), Kom; Stoppelkamp; Mugosa, Hoffer (Diamantakos, 46'). 1. FC Union Berlin: (4-3-3) Busk; Trimmel, Puncec, Leistner, Pedersen; Zejnullahu (Parensen 71'), Fürstner, Kreliach; Skryzbski (Redondo 74'), Polter (Kessel 88') Hedlund. SCORE: 0-1, Hedlund PEN 6'. 0-2, Kinsombi 37' OG. 1-2, Stoppelkamp PEN 78'. REFEREE: Throben Siewer (Drolshagen). Booked: Figueras (6'), Fürstner (27'), Kempe (54'), Pedersen (55'), Meffert (65'), Kom (78' & 90+1'), Diamantakos (81'), Parensen (84'). Sent-off: Kom (90+1'). 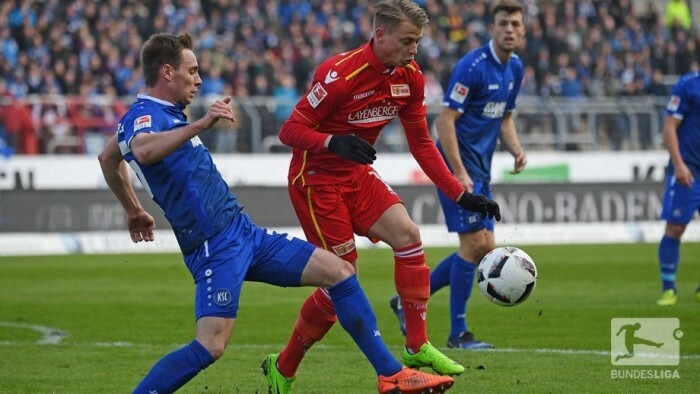 Promotion favorites, Union Berlin beat a committed Kalrsruher SC 1-2 away at the Wildparkstadion. A penalty by Simon Hedlund and an own-goal by David Kinsombi were enough for the visitors, as Moritz Stoppelkamp scored the only goal for Die Badener from the spot. KSC head coach, Mirko Slomka had announced to completely change his starting eleven after the last minute defeat at 1860 Munich last week. The 49-year-old made five alterations as Dirk Orlishausen, Dennis Kempe, Matthias Bader, Franck Kom and Stefan Mugosa replaced René Vollath, Hiroki Yamada, Charis Mavrias, Grischa Prömel and Dmitrios Diamantakos. Jens Keller altered his starting eleven in only two positions. Centre-back Toni Leistner returned and therefore replaced Emanuel Pogatez, while Eroll Zejnullahu took the place of suspended captain, Felix Kroos in midfield. Union Berlin began very well and were rewarded for their fast start. Four minutes into the game, Sebastian Polter was felled in the penalty box as David Kinsombi slightly pulled the forward's shirt after an incoming cross from the right. Thorben Siewer hesitated but eventually pointed at the spot and gave a debatable penalty, which caused huge upset on the home side. Nevertheless, Hedlund scored without any problems and gave Die Eisernen the lead. There was a lot of hectic play in the game after the penalty as Karlsruhe increased their pressure in the search for a quick leveller.. A corner for the hosts found Mugosa but his header hit the crossbar. Karlsruhe enjoyed a lot of pessesion and combined along the whole pitch, trying to find a few gaps for a possible scoring opportunity. Union Berlin did not invest much into the match after their lead. 25 minutes into the game, the hosts made their way up front as Erwin Hoffer ran along the left wing and looked for Mugosa in the middle but his cross into the box was not accurate enough. Valentini's cross resulted in a corner, which was not to trouble the Union defenders. After 35 minutes, Karlsruhe kept their possesion and dominance in terms of passing. However, just like in the past games, the hosts had problems with keeping their concentration at times. An error in the hosts defense saw Union make use of a huge gap, Zejnullahu crossed from the right, where Kinsombi unluckily deflected the ball into his own goal, doubling the lead for Union Berlin. After having caused a penalty, this own goal summed up Kinsombi's bad day. Furthermore, Valentini had to be subbed off just before half-time. The German-Italian injured was replaced by youngster Marvin Mehlem. The second half had to be better for the hosts in order to come back at the Wildparkstadion and Slomka reacted and brought Diamantakos on for Hoffer. It had the desired effect. There was more attacking into from the hosts, especially Moritz Stoppelkamp's effort, as his shot from a distance hit the crossbar in the 51st minute. The visitors remained steadfast in defence, not wanting to come out of their shell at the start of the second half. The blue-whites kept knocking on the door, Mugosa's effort, which was similar to Stoppelkamp's earlier, just missed the target. The ball seemed destined not to go past Jakob Busk in the away goal. Union remained passive in the match as Stoppelkamp crossed into the box, but Kom's header was not enough to trouble the Union 'keeper. Karlsruhe repeatedly tried to come back into the game. Mugosa, who made his way through into the box, was then brought down by Leistner in the area in the 77th minute. Throben Siewer pointed to the spot which resulted in a clear penalty decision. Stoppelkamp found the back of the net as his successful penalty-kick rewarded KSC's great effort. Franck Kom almost equalised twice as his header following Mehlem's cross resulted in a corner. Stoppelkamp then found Kom again, whose header just missed the target. Nevertheless, the following counter-attack was stopped by the Cameroonian, who picked up his second yellow and was sent off by referee Siewer just before the final whistle. The 2-1 win means Union are into the top three, while Karlsruhe is facing another relegation battle. This time, they're involved in a huge clash at the Millerntor-Stadion in St. Pauli next Monday. For the Berliners, they host 1860 Munich this coming Friday.